For many high schoolers, finding your place in the sea of so many clubs can be challenging. For Abel Sanchez ’18 and Ford Leonard ’18, they not only chose not only to start a club, but also a non-profit. Sanchez has had many years of advanced experience in computer science. Including cancer research at the Cambridge Broad Institute. By using his computer skills, he was able to code visualization of tumors. Additionally, he worked on the mainframe at Broad to transfer data. His efforts at Broad, led to an invitation to a charity event with microsoft where he taught young kids who are visually impaired how to program. And that is not all. This year he was invited to go to Mexico and teach as part of MISTI. “MISTI is a program that helps international students. I taught for a month in Mexico and it went insanely well. Because it went so well, I decided to launch it locally. I will be going back and teaching around 1000 kids,” Sanchez said. Since computers are not cheap, these students have a plan to raise funds for the non-profit. Ford Leonard, Sanchez’s counterpart is not as experienced with the computer science itself, but plays the integral role of communications, fundraising, advertising, and human resources within the club. So far, Leonard and the members of ChicasCode have taken many lengths to advertise and prepare for the launch. They have exhausted all their options of preparation to aim for their scheduled for October 30th start. 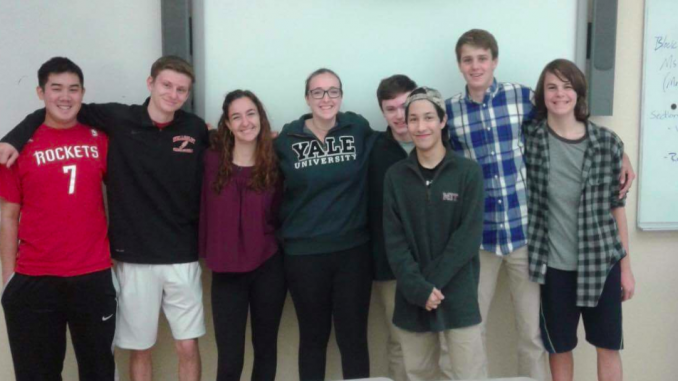 “We have done so much to prepare for this launch such as, setting up our website, building our social media, gaining sponsorships, organizing a bake sale, [putting] fliers around the high school, presenting ourselves to the Bradford, Swellesley report, the Townsman and other local newspapers. We have emailed teachers, gaining their support for our club, [and] we have set up dates for Roche Bros to set up a stand,” said Leonard. Grace Zientara ’18 who plans to go into biology in college, hopes that this will lead to a bridge in the gender divide of the professional sciences. “We just want girls more interested in [science] and to realize it is not a scary field to go into. Like coding, yes you can code an entire website if you want to and it might look scary now, but we can do it bit by bit and teach you bit by bit,” Zientara said. ChicasCode is targeting for middle schoolers, but enrolling anyone from elementary through high school. For now, it is not a national club, but the members have already reached out to others in surrounding town and anticipate other chapters opening.